Mark Twain said, 'Mauritius was made first, then heaven was copied from it', and when you consider the natural beauty of the volcanic island, with its steamy forests and running streams, palm-fringed beaches and teeming coral reefs, it's easy to understand his sentiment. Most visitors to Mauritius choose package-tour holidays and stay at one of the island's magnificent resorts. The capital, Port Louis, is the tourist hub of the island, but there are literally hundreds of excellent beach resorts lining the Mauritian coast. Most of the resorts sport luxury amenities such as golf courses and spas, and watersports like diving, snorkelling, windsurfing, sailing, and fishing. 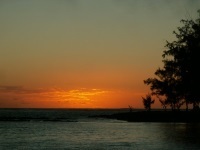 The one drawback to a holiday in Mauritius is the long flight time for British and American visitors. This is a shame because those who do brave the journey will be richly rewarded by one of the world's true island paradises, a place that somehow manages to be both comfortable and exotic, luxurious and pleasantly 'off the beaten track'. The climate in Mauritius is hot and tropical, tempered by cooling trade winds. Winters are warm and dry and summers are hot and humid, but the merciful sea breezes keep things from ever getting too unbearable. Mauritius can be visited at any time of year, though bear in mind that it rains heavily from January to March and that this is also cyclone season. The peak tourist season in Mauritius is from October to April, so if you're planning on visiting during this period be sure to book accommodation well in advance. Read more about Mauritius Climate and Weather. - The Ile aux Aigrettes Nature Reserve is a premier eco-tourism site, offering guided jungle tours of an island rich in endemic fauna and flora. - Relax on Mauritius' legendary beaches, including Flic en Flac, Grand Baie (great for watersports), and Trou-aux-Biches (for diving and snorkelling). - A visit to Grand Bay, the centre of tourist activity in Mauritius, is a must for visitors to the island. Read more about Mauritius Attractions. - Get involved in some watersports such as surfing, sailing, fishing, diving, or parasailing. - Search the nooks and crannies of the open-air Flacq Market for great bargains and souvenirs. - Take a jungle hike to a refreshing waterfall in Black River Gorges National Park. Read more about Mauritius Activities. Mauritius is perceived to be difficult to reach for British and American tourists, though in reality this is not the case. Direct flights to Mauritius are available from a number of UK airports, with the flight taking a manageable 10 hours. American tourists will have to book a connecting flight, meaning they might be in transit for a full 24 hours. Get more information on Mauritius Airports. Georges by Alexandre Dumas and The Mauritius Command by Patrick O'Brian. Creole rougailles, spicy biryanis or tandoori curry dishes are common mains, with gateaux or traditional Indian sweets for dessert. Cane rum, Mauritius' main alcoholic product, which is delicious with coconut water and a dash of lime. Carved wooden figurines, home-made jewellery, perfumes made from essential oils, hand-woven rattan bags, and local spices all make great souvenirs. Make sure you have a small backpack with you to take on day excursions, and always carry plenty of bottled water around. Pack sturdy shoes to protect your feet on some beaches, as there is a threat of sharp coral and stonefish stings. The Festival International Kreol (November/December) is a celebration of Creole culture held in various venues across the island: poetry readings, Sega dancing, music performances, art exhibitions, and epic parties characterise this jubilant event. Mauritius celebrates its Independence Day on March 12, prompting impressive firework displays and wild parties in the capital of Port Louis. - The dodo, the famous flightless bird, was native to Mauritius until it was hunted to extinction by European settlers. - Mauritius is the most densely populated country in Africa. An enticing and exotic destination, Mauritius is a great choice for an island getaway packed with brilliant sunshine, beautiful beaches, and unbeatable outdoor activities.